During the months of May through August, Redberry houses anywhere from 20-30 horses. These horses are used for both our summer camp programs as well as our rental programs. Our camp has hundreds of acres or riding land at our disposal for you to explore. During our off-season (October - April) we encourage pastors and other ministry professionals to enjoy this retreat cabin. We offer this free of charge to pastors and their families who need to get away for a few days. There is plenty of room for car parking here. In addition we have some trailer/camper hookup spots that can be used near our ranch camp facilities [ 42 ]. These cabins are primarily used as staff housing during the summer season, as they are not winterized. The gym lodging is used year round for staff & rental accommodations. These cabins can hold 9-10 persons. During the kids summer camps there are 2 staff per cabin. In addition to these cabins there are summer tent/cover-all structures that house our Girl's Riding Camp campers. These are located at Ranch Camp [ 42 ]. 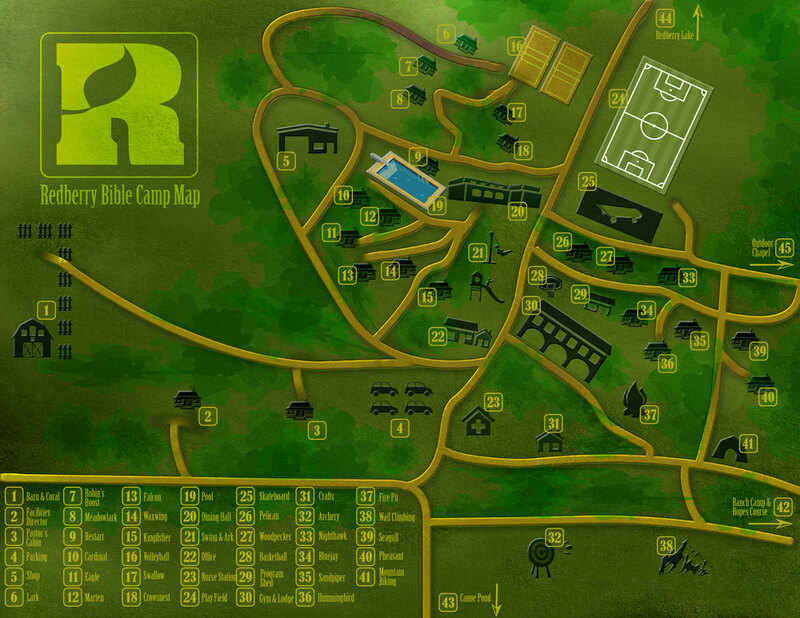 Excluding staff, Redberry's main camp can house up to 125. Upon request and permission granted, rental groups can make use of our staff housing adding additional spaces. Note that cabins [ 9, 14, 33 ] are not winterized. We have 2 full beach volleyball sand courts. Our pool is traditionally open through June to September. Change rooms & showers are located in the dining hall washrooms just across from the pool. The dining hall building can seat 150, and includes a full commercial kitchen. The dining hall washroom facilities include showers. Our playground structure, the Ark, and the Jungle Swing are camp favourites. This main camp office is used full time from May - October. Redberry has a secondary office located in Saskatoon. Attached to the office is Loon Lodge, a separate staff apartment-style housing unit. Our medic's station is where the summer first-aid personnel/medic is housed. The building is separated from the main camp in case of the need to quarantine, and includes a bed for sick campers. This large open section of land is used for sports, and other games needing an open space. We have various sizes of ramps, rails, and boxes. We have features that are appropriate for all age and skill levels. Half court cement pad basketball court as well as full court cement pad (25 - South half of skatepark). Houses all of our program supplies. This is a full size gym facility (50 feet x 70 feet). The upstairs section of the building includes seven full season rooms. The facility also has several bathrooms and shower facilities. Our wheelchair-accessible washroom facility is also located in this building. This is where our craft activities are run. It is stocked with various craft supplies. Our archery range includes 5 targets as well as wildlife decoy targets. We use compound bows for our archery skill. Our fire pit area includes bleachers to seat a full camp. Our climbing wall is 40 feet tall with 4 sides for various skill levels. We also have a small bouldering wall on the inside of the structure. This holds all of our mountain bikes, and bike supplies. This is a separate camp facility, and includes 2 cover-all tents, a cover-all dining area, outhouses, a fire pit, and a storage shed. This is used for our Girls Riding Camps. There are trailer and tent sites are available in this area. A low ropes course surrounded by trees. A short walk past our hay fields is a pond that we use for canoeing and kayaking. At one point in Redberry's history the lake came right up to the back of the dining hall. That was 25+ years ago. Since that time the lake has receded up to 2000 meters. The receding waters has given the camp a lot more land and for a time included a large beach. Recently the water has come up considerably, and the beachfront is currently underwater. During the summer camp programs this facility is used as an alternative fire pit area.